Participants of the SpaceLab rapidly ideating solutions to challenges they identified during their Discovery process. The Colorado Education Initiative launched the SpaceLab Design Network, a cohort of 30 educators, administrators, students and parents from across the state of Colorado who collaborated over the course of six weeks to explore the most pressing challenges and opportunities and use design thinking to create innovative solutions for Colorado’s education system. 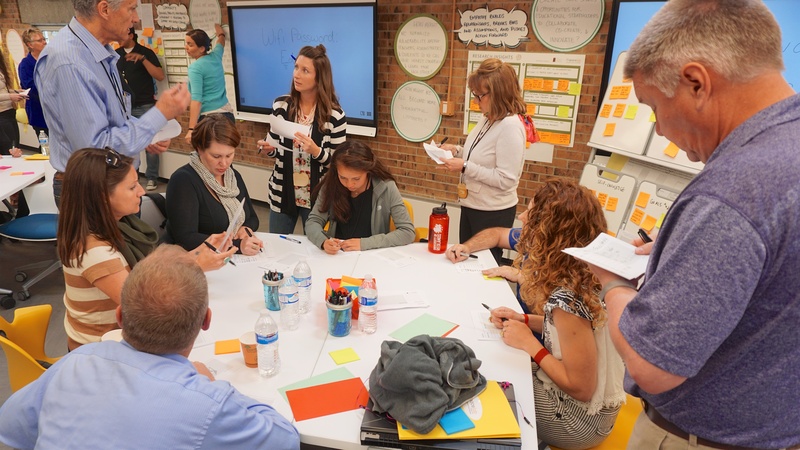 SpaceLab is The Colorado Education Initiative’s (CEI) series of next generation professional learning that carves out space and time for educators, business leaders, and community partners to think, collaborate, listen, share, and innovate. CEI created SpaceLab in direct response to feedback that educators need space and time to creatively tackle challenges and build innovative, impactful solutions. Programming includes networking sessions, design thinking workshops, and seeing is believing expeditions. SpaceLab prioritizes strategic partnerships and believes in investing in both innovators and innovations. Collaborating closely with The Colorado Education Initiative, GRID Impact helped design and facilitate the six week program. 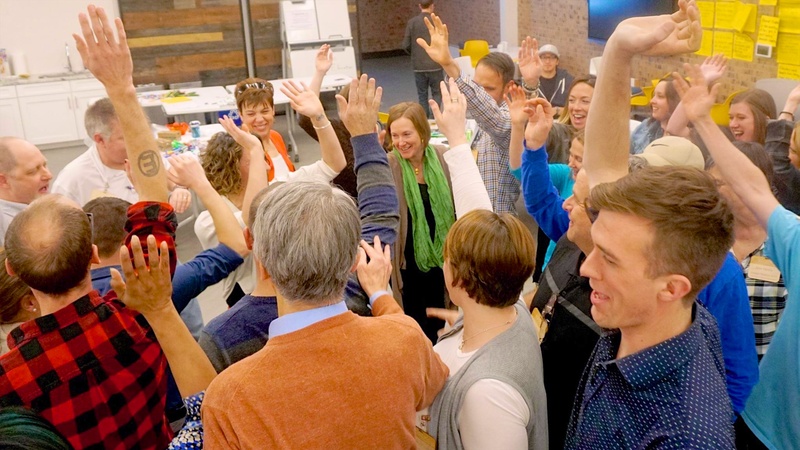 SpaceLab kicked off with a two day "Discovery Convening" in Denver where GRID Impact introduced participants to design thinking and human-centered design methods. After a series of hands-on activities, GRID Impact led a deep-dive into Discovery methods to prepare the participants for the research they would conduct on their own in their school districts. Using the Discovery Toolkit prepared by GRID Impact, each participant created their own problem statement and research plan. This is a group that brings amazing insight, energy, compassion, and support to everyone that is involved. I can honestly say that every time I leave a gathering, my practice and my personal outlook are changed for the better. Set the stage for SpaceLab and build excitement amongst the participants. Provide participants with an understanding of the value of design thinking and understand how it can bring innovation to education. Equip participants with the tools and resources to conduct research in their school district and find meaningful insights. After four weeks of Discovery research in their school districts, SpaceLab participants were invited back to Denver for a "Learning Convening." The Learning Convening involved collecting and sharing observations from the Network’s discovery research, determining insights as a result of those observations, unveiling the opportunities that exist, and coming up with ideas for moving forward. We transferred the importance of connecting to our work to getting to the root of the problem. We built empathy with people in our community to gain an understanding of their perspective and needs. In many cases, by listening and empathizing, our relationships developed with those helping us solve the problem. We connected. SpaceLab participants then facilitated rapid ideation sessions with members of the community and pitched their concepts to CEI. Facilitate share out of participants’ experiences and research findings. Guide participants through synthesis of insights and learning across the group, converging on 5-7 opportunity statements. Prepare SLDN participants as leaders for group ideation with community "co-creators." Help participants explore and visualize their ideas and facilitate the selection of "top concepts" for CEI to further develop and prototype. SpaceLab participants celebrating at the conclusion of convening. I was a co-facilitator along with Alexandra Fiorillo and Tania Garbe from GRID Impact. The SpaceLab Design Network was an opportunity to accumulate a great deal of information, strategies, and ideas for how to greater facilitate the adult-student relationship.